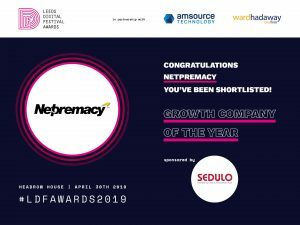 We are delighted to announce that Netpremacy has been shortlisted for Growth Company of the Year and Tech Employer of the Year at this years Leeds Digital Festival Awards. The Leeds Digital Festival Awards aim to celebrate the best of the digital & tech industry in Leeds and the wider North West region, awarding organisations and individuals who are inspiring and driving the vibrant industry forward. Netpremacy has been shortlisted for Growth Company of the Year after seeing a 45% increase in headcount through 2018 and the opening of new offices in Alton and Bristol to support our growing customer base. Netpremacy has also been shortlisted for Tech Employer of the Year due to our commitment to doing the most for our employees through training, development and innovative working practices, as well as extra perks such as free food Friday and monthly massages. The award winners will be announced on 30th April. Leeds Digital Festival takes place between 23rd April and 3rd May 2019. Join us for our event, ‘The Future of Working’ as part of Leeds Digital Festival on 25th April.